Following this month's high profile release of the Apple iPad, a number of other new tablet PC devices are set to be released later this year – with HP's Slate being one of the biggest contenders in this new market. That device has been shrouded in secrecy since it was announced back at CES in January 2010, though some details on the specs and pricing have now leaked online. 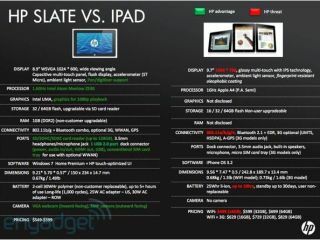 HP employees have been given an internal HP Slate presentation that compares the device to the Apple iPad, with Engadget obtaining a copy of the slide, which you can see here. HP's slate device will cost $549 for the 32GB flash storage version or $599 version for the 64GB version. The device will feature a 8.9-" 1024 x 600 capacitive multitouch display, a 1.6GHz Atom Z530 processor with UMA graphics, an accelerator for full 1080p video playback, and 1GB of non-upgradeable RAM. HP is also set to include a two-cell five-hour battery, an SDHC slot, two cameras, a USB port, a SIM card slot for an optional 3G modem and – a boon for plugging into your TV at home - HDMI out. It will ship with Windows 7 Home Premium. Expect more details on this in the coming weeks, now that the iPad launch hype is starting to die down a little.